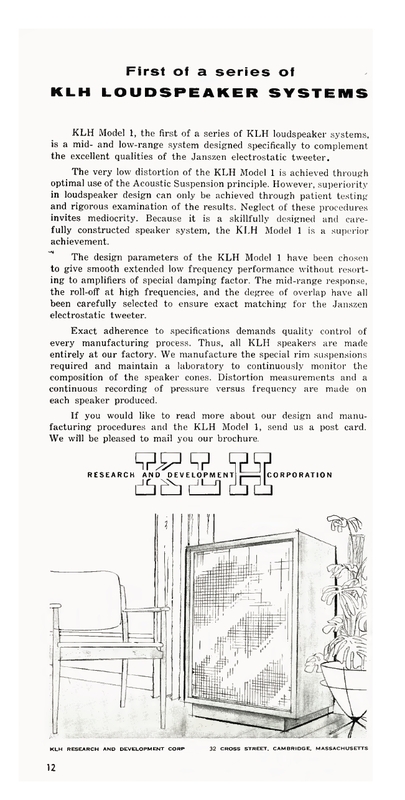 KLH as a company made its presence known in May of 1957, not long after Henry Kloss left Acoustic Research to start his own company, and its first three speakers were introduced in June of 1957- Models One, Two, and Three. These are dual 12" woofers (initially they were called 11"), each sealed in their own individual 2.25 cu ft chambers. There are a few issues at present with this pair. The sides are painted black. The woofers could probaby stand a coat of sealant (though they seem quite robust). These came from an estate sale in Virginia; the accompanying Janszen are both non-functional at present (Jan 2016). The goal is to refurbish and rebuild both pair of speakers. Refurb for the KLHs is largely cosmetic. There is no internal network: the speakers are just connected straight to the amp. The Janszens will need new components. Note that the drivers are cast-aluminum frame style. The epoxied drivers came a little later. 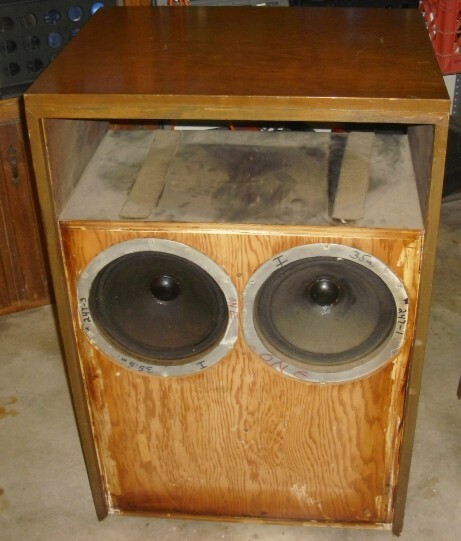 At the bottom are several comments about this speaker, and the other original systems (including the Model Four) from ClassicSpeakerPages.net. Listening impressions: I am surprised by the depth of bass. My reference speakers are Acoustic Research AR3a, and they are seriously challenged by the KLH Model One. The serial numbers are 002 and 659. Here's the instruction brochure that came with them. 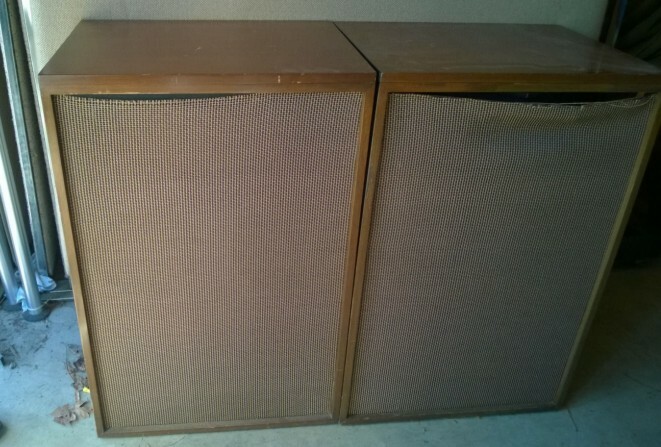 One I believe the Model One had two (parallel-wired) 32-ohm versions of the KLH Four 16-ohm woofer, which was called an "11-inch woofer," and each woofer was in its own separate 2.25 cu.ft. enclosure -- each somewhat larger than the usual 1.5 - 1.7 cu.ft. 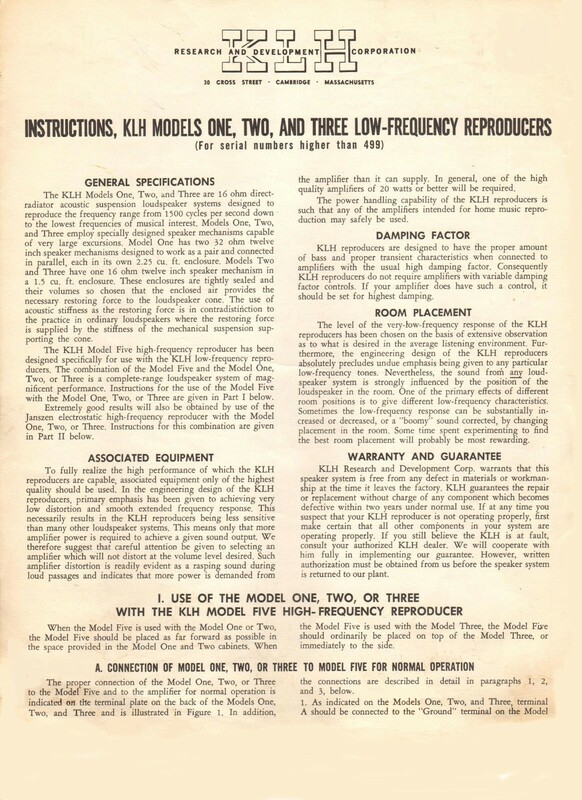 KLH Four, Three and Two models. The woofers still had approximately the same f(s) as the Four, maybe slightly lower; therefore, the One would not necessarily go lower in bass, but with two woofers doing the job of one, the distortion would definitely be lower and the output could be jacked up higher without overload. It would certainly be a more powerful-sounding woofer, particularly with the tone controls or an equalizer adjusted for more bass response. Having two woofers working in tandem brings on another phenomenon: mutual-radiation impedance, whereby the output down to resonance is amplified by nearly 3 dB due to the proximity of the two woofers operating in the same frequency range. One other observation: I am not sure if the Model One, Two or Three had the epoxied-in woofer, but it must have had it since the model Four came on stream shortly after KLH began operations. Incidentally, I don't believe that many of the Model Ones were built. They were just too expensive (at nearly $400 each back in 1957-1960), large and heavy. Besides, one had to add a tweeter unit such as the Model Five tweeter or the JansZen electrostatic. My bet is that fewer than 1000 were made, if that many. Two As others have said, crossover capacitors are the bane of the early epoxied-in KLH speakers, such as the Model Four, Model Six and Model Seven. Ironically, the earliest versions of the Model Four and Six (and possibly some Sevens) used war-surplus oil-filled capacitors, and these versions perform flawlessly over the years. These capacitors probably will never fail, but who knows! 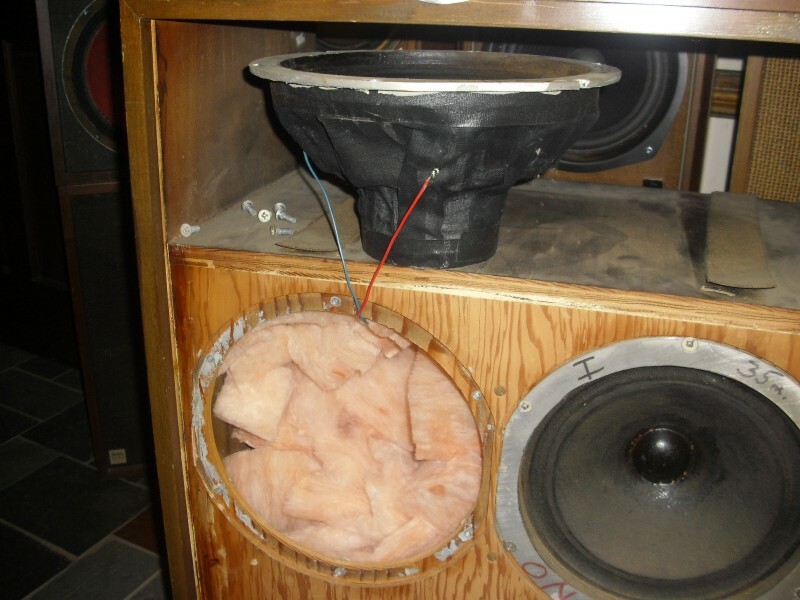 The way the factory repaired these speakers in the old Henry Kloss/KLH days was to remove the grill cloth and black-muslin (which destroyed them both, basically), "rip out" the old woofer cone and voice-coil assembly, and then make the necessary repairs through the woofer hole. A new cone was then re-attached (this was probably dicey even at the factory), and a new grill was affixed and the speaker was repaired and sent back to the owner. Only the factory could do this type of repair from all I have ever heard. There is about no alternative other than to cut a hole in the back of the speaker to make the repair. A hole could also be cut in the front of the speaker the same way, and the grill cloth could then be permanently attached after the repair. The grill was originally glued down into slots around the perimeter of the front of the baffle board and was thus made "permanent." Some individuals have been able to knock the front baffle loose from the cabinet, but I would be afraid to try to do that for fear of damaging the rest of the cabinet. In most liklihood, the rest of the cabinet would have been destroyed in the process, so a hole in the back is probably the least traumatic means of gaining access to the crossover. Three I think we may have overlooked KLH's 50th birthday last year, with it's founding having been in early 1957. Nertheless, March 1958 will mark 50 years since the model six was introduced to the public and press. I'm fairly sure the model Four was also introduced at the same time. These two models were KLH's first full-range loudspeakers and they launched the company into the mainstream speaker market. The model Four was pricy at about $225. and sold slowly, but was chosen as the monitor speaker at CBS Records. Last year a forum member noted his pair of model Fours, serial numbers in the 6,000 range are dated June 1964 which must have been near the very end of production. The model Six on the other hand stayed in production some 14 years with near 200,000 units made. The public loved the model Six and most of us have owned at least one pair in the last half century. 14 years in production must be a record ? The press raves ! The May, 1958 issue of AUDIO said - "Using machine-run curves and a calibrated Western Electric 640AA condesor microphone, several different types of tweeters were compared. The effects of diffraction of varies baffles were noticed, and the curve of the unit used in the Six was considerably smoother then we have come to exspect from cone tweeters with response extending well out over 15,000 cps. The model Six is capable of performance which we have come to think of as unbeleivable for so small a cabinet. "......This review along with the solid low frequency reputation KLH had established with models One,Two and Three would have convinced me to buy a pair in 1958. Four >This is a great question. >Although the 3as bass, according to AR, extended approximately 1/3 of an octave lower, it sounded even more dramatic than that. While the 2x/2ax/5 all had solid, tight, full bass, the 3as bass was magisterial, especially for its day. To be listening to a good recording and all of a sudden, without warning, to hear and feel a really low tone come across the room and fill the pit of your stomach was really something. The 10-inchers never shocked you like that. The 3a did. >Many people will tell you that the 3a had a definite heavy or slightly sloggy character to its sound. For whatever reason, the lower mid region seemed to project a kind of thickness that at times made the 3a sound slow on its feet and lacking in detailespecially when it was compared in a retail showroom A-B against the Large Advent. >In addition, the 3as mid is rightly characterized as having a bit of a honky or woody coloration. The 2ax didnt seem to suffer from these traits, and despite its less extended bass, the 2ax could often sound more natural and less colored than the 3a. >BTW, there was no difference in their highs. They both used the same ¾ dome tweeter, both crossed over at 5000 Hz. The 3a did have superior midrange dispersion, with its smaller-diameter 1 ½ dome mid driver covering a wider frequency range than the 2axs 3 ½ midrange cone. >The 3a was almost twice the money of the 2ax: $250 ea. vs. $128 ea. Value was the 2axs strong suit. >But now, 40+ years after the fact, the 3a might have greater appeal if just for its historical position alone. Id take the 3a today. And no amount of low-frequency compensation, no matter how judicious or frequency-specific, could make the 2axs bass sound like the 3as. Steve gives an interesting, and I believe accurate, accounting of the apparent sonic differences between a speaker like the AR-2ax and the AR-3a of the 1970-vintage period. As for bass, the AR-3a's 12-inch woofer definitely had an advantage over the 2ax's 10-inch woofer, but the differences were fairly subtle until you put on music with sub-sonic frequencies, pipe-organ bass or perhaps a jazz recording with a (sometimes rare) well-recorded kick-drum bass line. The beauty of AR's 12-inch woofer was its very low distortion. Depending on the setting of the level controls and the music content, the bass could sound "heavy" at times. Yet the AR-3a did have some perceived issues, some of which were mentioned in a 1970 issue of Consumer Reports magazine. 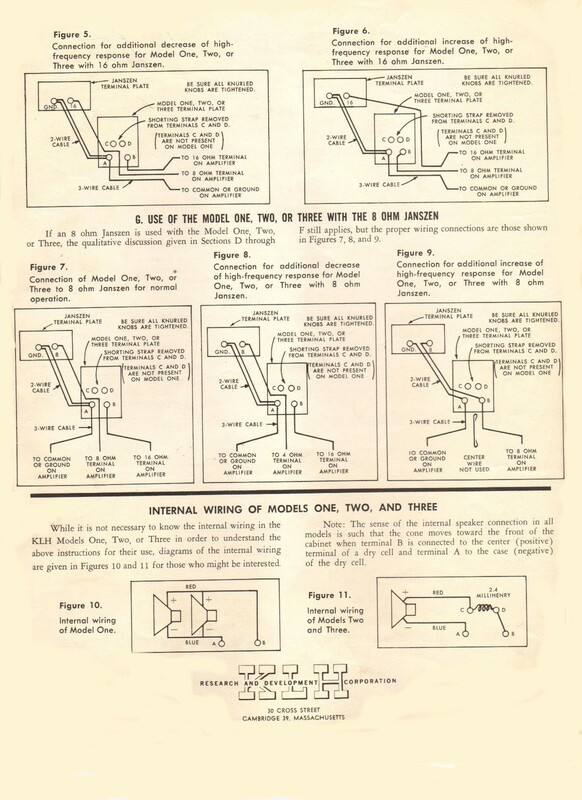 Prior to that, however, the organization tested some of the earlier speakers, and the AR-3 (the famous AR speaker model that preceded the AR-3a) did indeed receive a top rating in the April 1965 issue. It was rated along with the ADC 303A, AR-2x, AR-2ax, KLH Model Six, Fisher XP-7, Sherwood SR-3, EMI DLS-529 and the KLH Model Four. In this test, CU noted: "The AR-3 produced the deepest bass of any loudspeaker tested. Sound in highs particularly smooth. Within the check-rated group were the two most expensive loudspeakers tested, the KLH Four and the AR-3. CU found that their prices buy you profoundly clear and deep bass response -- the lowest octave in the musical spectrum. In this they clearly stood a notch above the others tested, with the AR-3 having a slight edge on the KLH Four. In the vital higher frequencies, however, neither speaker was considered particularly better than the others in their group. For instance, the KLH Four was slightly peaky in the treble, lending its sound a mild 'presence.' And the 'smoothness' that CU noted in the AR-3 was in reality a small defect, the result of a slight, but measurable lack of energy in the region near 8000 Hz -- the region of much significant music as well as hiss and record scratch." In May 1970, CU again looked at loudspeakers, and although they did not specifically test the more-expensive models such as the relatively new AR-3a and Bose 901, the organization decided to look at the new unit even though it was outside of the scope of the speakers being tested in this issue. 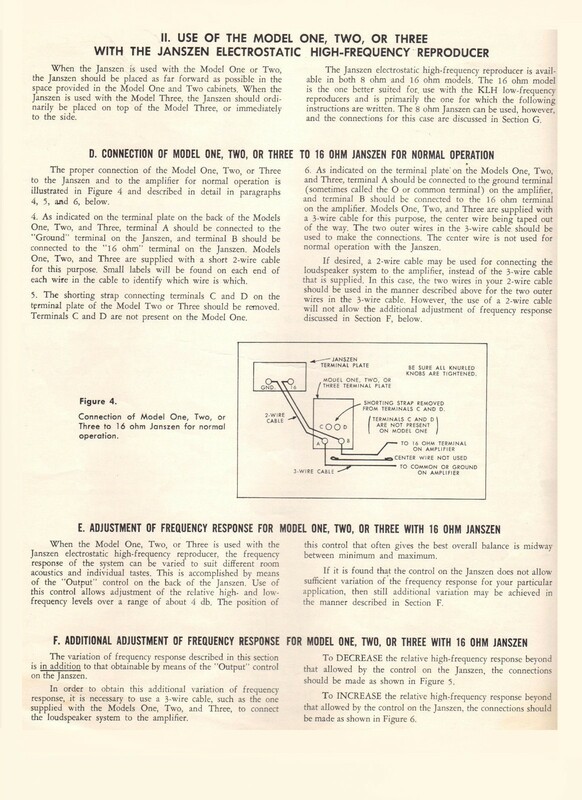 It was in this issue that CU opened a can of worms with its comments on the Bose 901 (resulting in a major lawsuit) and almost unnoticed, there was a paragraph on the AR-3a, which stated, "In April 1965, CU check-rated the Acoustic Research AR-3 loudspeaker and noted that it had the deepest bass response of any speaker we had ever tested. Naturally, we were curious about the quality of its successor, the AR-3a. So we decided to test it even though its price ($250) put it well outside the scope of the accompanying report. The AR-3a delivered just as good bass response as it predecessor, but we heard and measured a distinct exaggeration in the middle frequency register that made the speaker sound thick and heavy. (On investigation, we traced the peak to the AR-3a's new mid-range unit, combined with a similar problem in the woofer). We found a similar problem in the treble, too. Even with the tweeter control fully advanced, the tweeter could not match the relative loudness of the woofer. That made the treble in the AR-3a sound a bit distant, although the tweeter frequency response was very smooth and extended. Had we ranked the AR-3a with the other speakers in this report, it would have fallen between the high- and medium-accuracy groups. Thus, in CU's view, the AR-2ax is a better speaker than the AR-3a -- and the AR-2ax costs only half as much." Interestingly, all of the audio-magazine test reports of the AR-3a were simply stellar, with no mention of the problems that CU encountered. Many magazines stated that the AR-3a was for them "the reference standard," and so forth. This is not to say that CU was wrong, but there has always been a lingering question about the listening environment of the CU laboratories at the time of the 1970 test report. It should be noted, too, that AR did modify the crossover in the AR-3a around the time of this test -- an inductor value was changed slightly, but probably mostly to accommodate the new ferrite-magnet 200003-0 woofer used after late 1969 in the AR-3a. I have owned and used several versions of the AR-3, AR-3a and AR-2ax. My impression is that you must get well back in the room when listening to the 3 and and 3a -- more so than with the AR-2ax. In fact, the AR-2ax images much better than an AR-3a, simply because the midrange is much more directional. Moreover, the very wide dispersion of both the AR-3 and 3a cause considerably more destructive interference, lobing and so forth when heard up close in the near field. These anomalies are almost impossible to detect well back in the sound field, and the superior dispersion in the midrange pays big dividends when listening in the reverberant field. What it really says is that the AR-3a is somewhat more finicky about placement in a listening room than the AR-2ax, but once it is placed properly, it can produce a much more spacious and natural sound. Five >Wow, cool stuff! Having never heard a pair, wondering how they compare to, say, a 3a, LST or Allison:One. Well, I have a pair of KLH Model Fours in great working condition, and I have compared them many times to AR-3s, AR-3a and AR-LSTs. The Fours are wonderful speakers, if a bit bright at times. The Model Four has a system bass resonance of about 46 Hz, slightly higher than the AR-3, but it is an excellent design that has excellent bass extension and very low distortion. 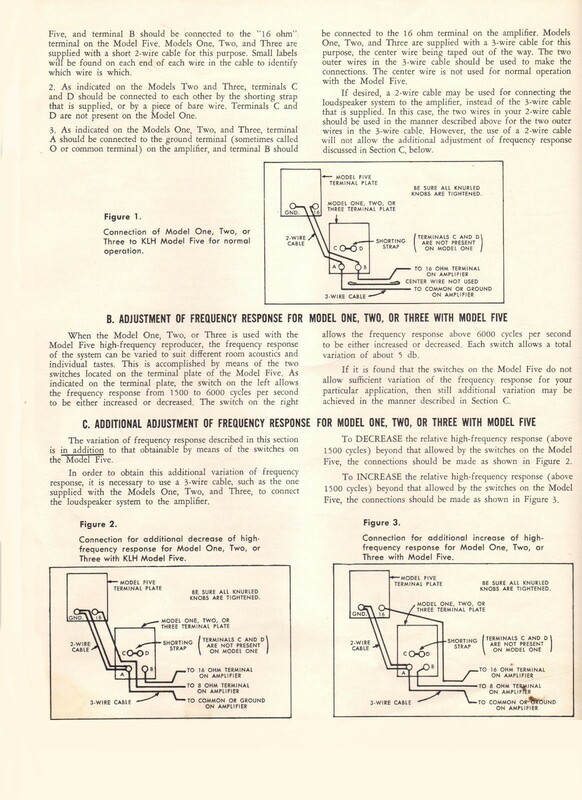 The bass response from the Model Two (and Model Three) was basically identical to the Model Four, so the performance would therefore be quite similar in the lower frequencies to the 12-inch AR models (such as the AR-1/AR-3/AR-3a and AR-LST). The Allison: One also has the approximate same resonance and low-frequency performance as the AR speakers, and it is a low-distortion design with its dual 10-inch acoustic-suspension woofers. So... in the deep-bass department, all of those speakers were, I believe. very similar. Consumer Reports found that the AR 12-inch woofer had a slight edge over the KLH Four, mainly in lower distortion, but their report did not detail their findings. As for the treble response of the Model Two with its JansZen electrostatic tweeter, I have to agree with Speaker Dave about the questionable placement of the tweeter inside that shelf. There would be some very destructive interference effects with the four-paneled electrostatic tweeter mounted in that shelf (thus the reason that KLH later went to their Model Five tweeter version for that shelf). 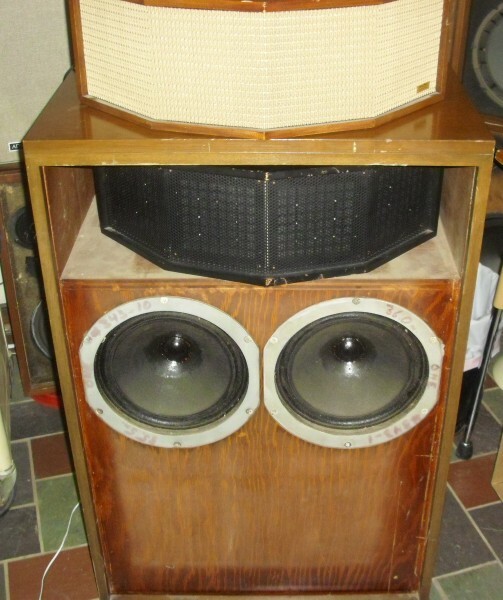 However, if the JansZen 130 electrostatic (assuming that these electrostatic tweeters were in proper operating condition) were taken out of the shelf and placed on top of the speaker cabinet, the differences would be significant, and I suspect that this speaker would hold its own pretty well against some of the best out there of that era, at least up to 14-15kHz.